I have no idea what to call this cake. It’s a new one for sure. The idea started when I was sifting through a bunch of old Tasting Table emails I get for chef’s recipes. Liquid Cheesecake was the recipe that caught my eye. Liquid Cheesecake? I must know more! It is a recipe from Christina Tosi, the dessert chef of Momofuku Milk Bar (I swear, it’s a coincidence, I’m not obsessed!). It had mentioned in the intro blurb that it could be used as a cake layer. Hmmm…the brainwaves started waving. Cheesecake in itself is heavy and full of its own smooth unique flavor. It would need to be sandwiched between a cake that was lighter and not as sweet so it won’t compete. Sponge cake might fit the bill. 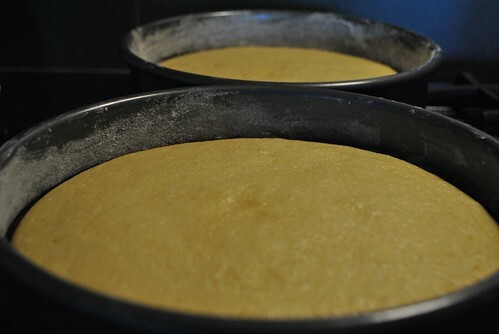 Besides, Juniors cheesecakes use a very thin layer of a lemon sponge cake as their crust. So, Sponge cake with a cheese cake layer. To wrap it all up, I need a frosting that was also light and not as sweet. Whipped cream frosting? Who doesn’t like cheesecake with whipped cream right? So, off I went, to assemble this cake, using two items I have never made before. I followed a recipe from the Cake Boss for his supposedly famous sponge cake. I don’t watch Cake Boss, so I wasn’t sure why this sponge cake was in such high demand. After a little internet searching, it seemed legit, and much easier than another sponge cake recipe I was originally going to use from joyofbaking.com that was based on one from The Cake Bible. I followed the recipe pretty exactly, except I did cut the sugar down by about half a cup. The recipe was easy to follow, and it came together okay. I only had two 9″ pans as opposed to the two 8″ pans it called for, so it came out a little thinner. Also, on top of the flouring of the pan, I also cut out parchment paper to put on the bottoms to ease the removal of the cake. 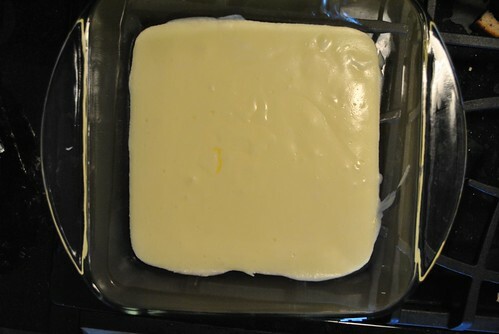 Lesson learned from my failed attempt at cheesecake a week ago. Don’t use the cheap stuff. I used Philadelphia Cream Cheese for this one, and followed the recipe almost to the T. I did cut the sugar down just a hair. 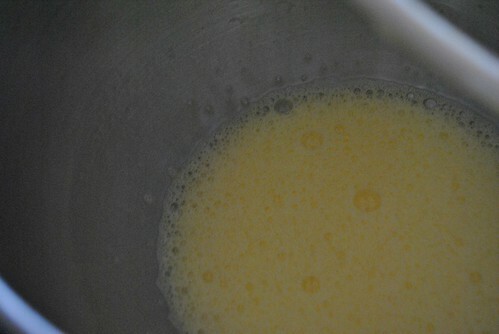 Also, it calls for the mixture to be poured into a pan lined with plastic wrap. I don’t know about you, but the thought of plastic wrap in a 300 degF oven made me a little uneasy, so I used a glass baking dish. 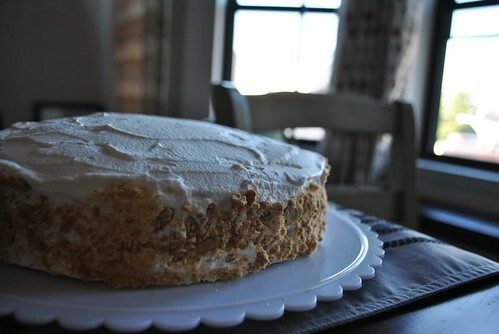 This recipe was adapted from the Cake Bible by joyofbaking.com. I love The Cake Bible. I really should get my own copy since I basically paid as much in overdue library book fees over the multiple times I’ve borrowed it. This recipe is very easy, but don’t whip it by hand. It will take forever and you will be very tired. 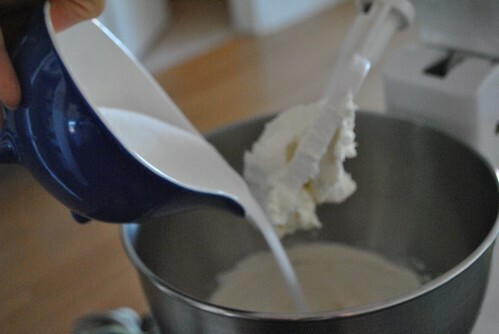 It’s basically making whipped cream and the chilling of the bowl, cream and whisk beforehand really does help it stay whipped nicely. 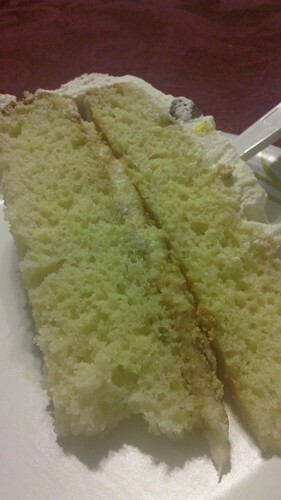 I put it all together, along with some crushed graham crackers sprinkled in between layers and mushed along the sides, and took it to an 11 year old’s birthday party. A few hours later, after having a slice, I was happy it wasn’t totally inedible. There is much room for improvement. First, the sponge cake. It was dense, a lot denser than I imagined. It was still moist and honestly, it tasted almost like the Chinese steamed sponge cakes my mom used to make for me. It was very eggy, and had that sweetness to it that I associate with those steamed cakes. I think next time I will try the other sponge cake recipe. The cheesecake layer was too thin. It needed to be thicker for more cheesecake impact. By itself, the liquid cheesecake was awesome. Those spoons I used went into the sink licked clean. I took the leftovers and lined a ramekin with leftover graham cracker bits, spooned in the leftover cheesecake and topped with leftover whipped cream. That’s for later. The whipped cream topping was the right choice. It made the cake pretty without making it over the top sweet, which my audience appreciated. 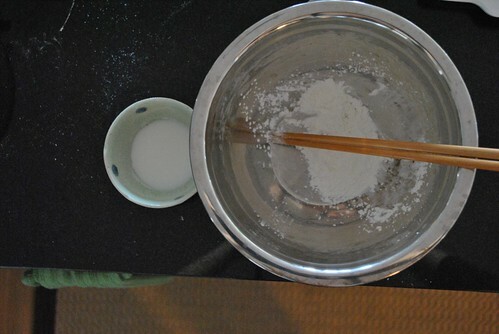 Sweet is enjoyed in slight moderation for the Chinese. I grew up in the US, so my tolerance of sweet is a little more skewed towards the American side of the sweet spectrum, but I too enjoy my sweets in moderation. I think next time, less cake, but more spongy, more cheesecake, and keep the whipped cream. Also, if not to be eaten right away, skip the graham crackers. Over time, they get soggy and just disappear into the cake. 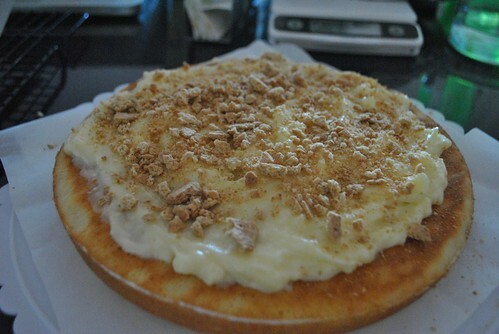 This entry was posted in Cake and tagged Cheesecake, Sponge Cake. Bookmark the permalink.